Justice Thottathil Bhaskaran Nair Radhakrishnan has been appointed as Acting Chief Justice of Kerala High Court. Justice Rajendra Menon and Justice Vimlesh Kumar Shukla have also been appointed as Acting Chief Justices of Madhya Pradesh and Allahabad High Court respectively. This is in view of the elevation of the former Chief Justices of these High Courts to Supreme Court. 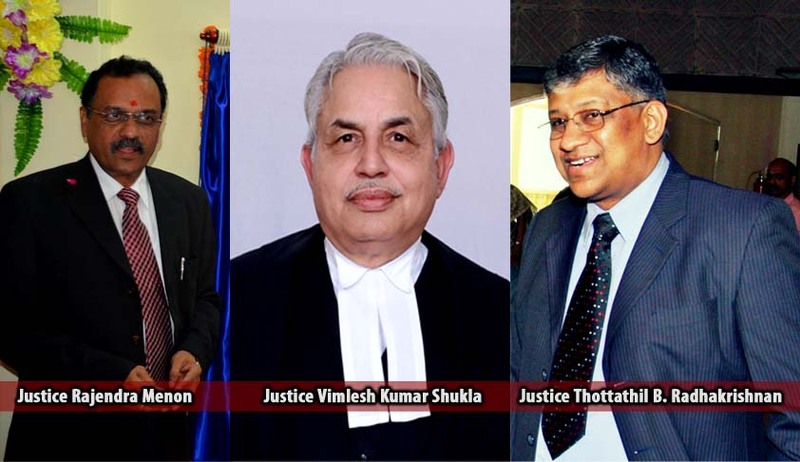 Justices Khanwilkar, Chandrachud, Ashok Bhushan were Chief Justices of Madhya Pradesh, Allahabad and Kerala High Courts respectively, before they were elevated as Supreme Court Judges. Justice Radhakrishnan, a native of Kollam District of Kerala, started his practice as an advocate in 1983 in Thiruvananthapuram. He later shifted his practise to High Court of Kerala at Ernakulam and practised in different branches of law, specifically in Civil, Constitutional and Administrative Laws. He got appointed as Permanent Judge of High Court of Kerala in 2004. Justice Rajendra Menon, who enrolled as Advocate in 1981, was appointed as Additional Judge of the High Court of Madhya Pradesh in 2002 and was made permanent two years later. Justice Vimlesh Kumar Shukla enrolled as an advocate in the year 1981 in Uttar Pradesh Bar Council, Allahabad. He was elevated as a Judge of Allahabad High Court in 2002.